Anamaya is located on a 3.75 acre property, surrounded by secondary jungle to the south, and primary jungle to the east and north. The property borders the Montezuma River gorge, which has many old and rare hardwood trees that have somehow managed to survive the axes and chainsaws of decades of human settlement. Costa Rica orchid in Montezuma at Anamaya Resort Geoff McCabe, one of the owners of Anamaya, has been hiking the area since 2004, looking for rare orchids, and has picked up hundreds that have fallen off branches, floated down rivers, or were found slowly drying up on dying trees. He has brought these orchids back to the property and planted them throughout. Most have taken root and are growing, usually blooming once a year. 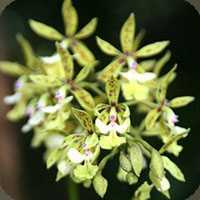 Geoff’s hope is that by saving the genetics of these orchids, they will be able to breed with orchids in the neighboring Montezuma river valley, and eventually seed and spread again throughout the area. Among the Costa Rica orchids found on the property are only species that are native to the area in this “dry tropical rainforest”. We have species such as Vanilla orchid, which is not only the world’s only orchid edible to people, but one of the world’s most expensive foods along with the Indian spice Saffron. Vanilla was used by the Aztecs, mixed with chocolate and chili, to make a special drink for the Aztec royalty. Anamaya has over a dozen Vanilla orchid vines growing on various trees throughout the property, but has yet to successfully harvest and vanilla beans. Blooming Vanilla Orchid flower found in Montezuma, Costa Rica Costa Rica has more than 1400 species of orchids living in the country, which is one of the highest diversities in the world. The Montezuma/Malpais area in which Anamaya is located is considered “dry tropical rainforest” and it has a lower number of species than the more rainy parts of the country. Only the hardiest of orchid species can survive our area’s dry/summer season, when it may not rain a single drop from mid December through the end of April. Orchid hunting is a passion shared by countless people throughout the world, and it’s a fun spin on a hike in the area. River valleys are public property in Costa Rica, so you can hike up a river with a pair of binoculars and try to spot orchids high in the branches of the trees. Finding one blooming is a special treat. Geoff has been documenting the area’s orchid types for five years, as shown here on his website: Costa Rica Orchids. Some of the species remain unidentified. Orchid poaching is common in Costa Rica, and one can often find orchids growing on pieces of wood outside the local people’s homes, often next to a local parrot held in a cage. Stealing orchids off living trees and putting parrots in cages are both illegal, but every year there’s more awareness among the Costa Ricans about protecting the country’s environmental heritage, which is one of the richest in the world, and also relatively well protected. Costa Rica’s forests are the only ones in Central America that are actually expanding in area every year.